Given a chance at age 35 to return to the starting lineup, Pepper Martin played with a boldness that electrified the Cardinals and startled opponents. On May 8, 1939, Martin revived memories of his daring Gashouse Gang days by executing one of the most exciting plays in baseball. Martin made a straight steal of home for the run in the Cardinals’ 1-0 victory over the Dodgers at Brooklyn. In sparking the Cardinals to World Series championships in 1931 and 1934 with fearless base running and relentless hitting, Martin had symbolized the spirit of St. Louis’ Gashouse Gang. As a center fielder, he had hit .500 (12-for-24) and had five stolen bases against the Athletics in the 1931 World Series. As a third baseman, he had batted .355 (11-for-31) with two steals versus the Tigers in the 1934 World Series. 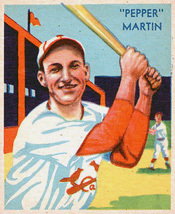 Martin had led the National League in stolen bases three times: 1933, 1934 and 1936. The 1939 Cardinals opened the season with an outfield of Enos Slaughter in right, Terry Moore in center and Joe Medwick in left. Slaughter, in his second big-league season in a career that would earn election to the National Baseball Hall of Fame, was batting .213 when, on May 5, Blades replaced him with Martin. On May 8, the Cardinals were at 7-7 and had lost three of their last four when they matched Bob Weiland, 33, a left-hander who had 16 wins for St. Louis the previous season, against the Dodgers’ Red Evans, 32, a right-hander who was back in the big leagues for the first time in three years. Scoreless in the sixth, Martin singled and advanced to second, then third, on a pair of infield outs. Evans, according to the United Press, went into a long windup against the next batter, Moore. Martin, seeing his opportunity, broke for the plate. He played 88 games for the 1939 Cardinals, batting .306 with six stolen bases and instilling an aggressive attitude throughout the club. Slaughter regained his starting job and hit .320 with 193 hits and a league-leading 52 doubles. First baseman Johnny Mize led the league in batting average (.349) and home runs (28) and had 197 hits, with 44 doubles and 14 triples. Medwick produced 201 hits and 117 RBI. The 1939 Cardinals led the league in hits (1,601), doubles (332), runs (779) and RBI (732). They were successful on 44 of 52 stolen base attempts. They finished with a 92-61 record and placed second, 4.5 games behind the Reds.